The Tribesmen finally make their 2016 Connacht bow on Saturday. Galway face Mayo on Saturday. WHEN GALWAY TAKE to the field on Saturday night in Castlebar, they will be the last county in action in the 2016 senior football championship. 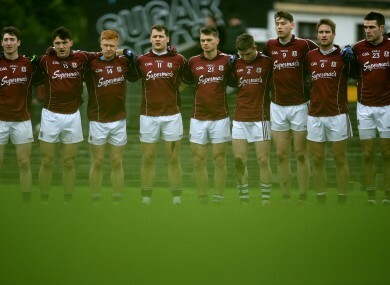 It’s a tough and torturous wait for them to sample action, given that it will be almost 11 weeks since their previous competitive outing – a Division 2 league tie against Cavan on 3 April. By the time of throw-in at 7pm in Castlebar, two counties will have seen their season grind to a half. They are the losers of Saturday afternoon’s qualifiers (Armagh v Laois and Louth v Derry). By the end of this weekend, two more counties will have exited the 2016 senior race. They are the losers of Carlow and Wicklow on Saturday night, and Leitrim against Waterford on Sunday afternoon. Galway get set for their first Connacht championship outing while Roscommon have already played three games in the province this season. It’s just another one of the quirks of the championship structure which draws complaints. Paul Flynn’s provincial focus may be on Dublin’s dates in Leinster but as secretary of the GPA, he’s keenly aware of imbalances in the championship scheduling. “In Connacht and it’s kind of a legacy thing too, there’s always one county who does it each year and it could be Roscommon next year. “It is a strange situation but it’s probably with the complexity of the fact that London and New York are in there too. “It doesn’t matter what county or what province it is, it should be a realistic review of the whole thing. “I wouldn’t mind a six-day turnaround compared to a 10-week run-in to a game, that’s being honest with you. I’ll never complain. “If you ask all the inter-county players now, the ones I talk to anyway, they love the league. Its game, game, game. I’ve said it before, I love the league. “You don’t necessarily train too hard, you train enough to make sure you’re sharp for the weekend and you go here or down the country maybe to play a game. Is Flynn aware of anyone in favour of the current championship structure? “It’s gas, good question, I actually haven’t. And I was only chatting with Alan Brogan there the other day, and he wrote an article on his views on it as well. “When I read it, his argument was, like, when you’re in the inter-county scene and you kind of get consumed by that … you do. Email “Galway's 11-week wait for Connacht senior action - 'It is a strange situation'”. Feedback on “Galway's 11-week wait for Connacht senior action - 'It is a strange situation'”.